Dana Springs is stepping down as the executive director of the Commission for Arts and Culture, a city agency that funds local arts nonprofits and directs the city’s public art program. Springs, who’s worked at the commission for 18 years and was appointed director in 2014, announced her resignation at Friday’s monthly meeting with arts commissioners, community volunteers who advise Springs and her staff. Springs did not give a reason for her departure but said she will remain on staff through March. She didn’t immediately respond to a request for an interview. Kris Michell, the city’s new chief operating officer, said finding a qualified candidate to replace Springs will be a top priority. “My commitment is to make sure we start working on this tonight, immediately, to find a replacement for Dana, who can’t be replaced,” Michell said. At Friday’s meeting, there was palpable tension between Springs, the arts commissioners and arts leaders who had shown up to make public comments. The friction was over proposed cuts for the budget year that will start July 1. The city is facing significant projected deficits, and the mayor’s office asked all city department heads to each propose two percent in budget cuts. Members of the commission were angry Springs had submitted three different options to accommodate the requested cuts. Several commissioners who don’t want to accommodate the mayor’s request were dismayed Springs did not tell him how they felt. The commissioners voted to draft a memo saying they had not signed off on Springs’ proposed cuts and will instead push for the full funding promised by the Penny for the Arts plan passed by the City Council in 2012. Commissioners are on high alert after the mayor last year proposed slashing the commission’s funding by 31 percent, or about $4.7 million. Arts advocates protested, and the City Council reduced the cuts dramatically, restoring arts funding to about $14.6 million. Vernon Franck, the commission’s vice chair, said stress surrounding budget cuts could have played a role in Springs’ resignation, which he said was a complete surprise. Kathryn Kanjo, the director of the Museum of Contemporary Art San Diego, praised Springs at Friday’s meeting. Peter Comiskey, who leads the nonprofit Balboa Park Cultural Partnership, did as well. Not everyone, though, has been pleased with Springs’ leadership. “I think there have been a number of concerns from people in the arts community about a lack of transparency in policies and decisions that are being made that affect them directly,” said Victoria Plettner-Saunders, an arts consultant who used to work at the commission. Plettner-Saunders took issue with Springs’ recent pitch to end some of the commission’s long-standing committees, which focus on specific subjects like funding or cultural tourism. 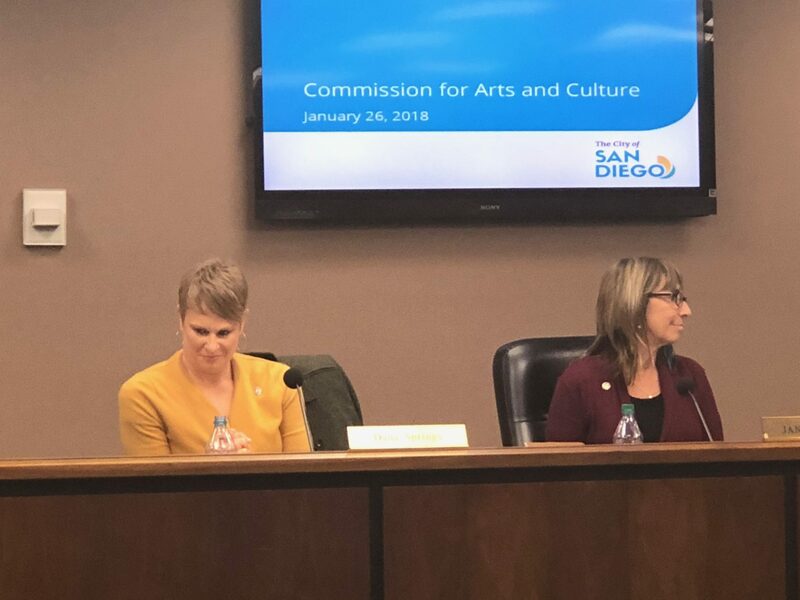 Other arts groups and advocates have complained about changes the commission made last year to programs that fund local arts and culture nonprofits. Peter Kalivas, executive director of the PGK Dance Project, which gets funding from the commission, has become a vocal critic of Springs and the commission. In a recent VOSD op-ed, he said the commission needs a radical overhaul. He opposed changes to the commission’s funding program that eliminated an appeal process for arts organizations that get a low rank from a panel that reviews funding requests. Since July, Kalivas said he’s been going to commission meetings to advocate for changes that would make the funding program more equitable for smaller, newer arts organizations. He wants funding caps and said the current system gives the most money to the oldest and most established arts organizations with the biggest budgets. Franck said Springs and the commission have considered changes to the funding program to send more money to smaller organizations. He said that’s made some of the leaders of the older, bigger arts organizations nervous, and that Springs may have been feeling that pressure, too.